OBSERVED: THIS INCIDENT HAPPENED THE THIRD WEEK OF NOVEMBER 2013, RIGHT AROUND THANKSGIVING. WE WERE AWAY IN EASTERN WASHINGTON DEER HUNTING. WE WERE HAVING OUR HOME BEING RE-SIDED WHILE WE WERE AWAY. UPON OUR RETURN THE CONTRACTOR TOLD US THEY HAD ROCKS THROWN AT THEM THURSDAY AND FRIDAY OF THE 1ST WEEK, WHICH HIT ONE OF HIS WORKER'S. WE HAVE MOSTLY RETIRED PEOPLE IN OUR DEVELOPMENT. THE FEW KIDS THAT DO LIVE HERE, WERE STILL IN SCHOOL BEFORE THANKSGIVING. THE SECOND WEEK THEY WERE FINISHING SIDING THE GARAGE, THEY THEN HEARD A DEEP BASED GROWL. THEY THREW THEIR TOOLS IN THEIR TRUCK AND GOT OUT OF HERE PRONTO. THE NEXT NIGHT THEY HEARD THE GARBLED SIERRA GROWL, AND AGAIN THEY DROPPED THEIR TOOLS AND RAN FOR THEIR TRUCK. THE WOODS WERE ONLY 5 TO 8 YARDS BEHIND THEM AS THEY WORKED. EACH NIGHT OF THE GROWLS IT WAS ABOUT 7 PM AND DARK. ALSO NOTICED: MY WIFE SAID SHE WOKE UP THE LAST NIGHT THAT THE WORKERS WERE HERE AND THOUGHT SHE HEARD THE DOOR KNOB RATTLING AT ABOUT 3 AM THE NEXT MORNING. I first spoke with the witness by phone for over an hour and he related all the details of his report without prompting or variation. I found him to be very credible as he explained not only this latest occurrence at the property, but also previous events that have occurred in the area. There have been several events over the years at this location, including a Class A sighting by the son of the witness, tracks found, horses stampeding, vocalizations, and creatures moving around the property at night. I visited the location and was given a tour of the area by the witness. The area has rolling hills and many heavily wooded areas that provide a corridor for animals to travel through the area undetected. 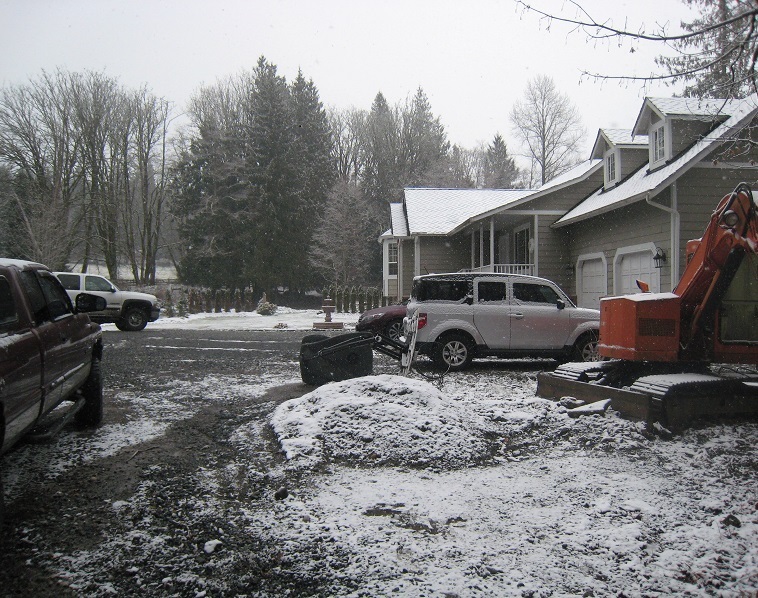 The wooded areas lead directly to the foothills of the Cascade mountains. There are several houses in the area, and many of them have large horse corrals, barns and pastures. Several of the home owners have heard screams, howls, and what has been described as Samurai Chatter. The area is plentiful with deer, cougar, bobcat, fox, and many other mammals native to the Northwest. Here is a picture of the area where the carpenters were working. A scaffold was set-up in front of the house to provide a stable platform as they replaced the siding on the house. In front of the garage was a covered work area where they would cut the siding and store their materials. The view is from the woods from where the growls were heard and the rocks were thrown that hit the scaffold and one of the workers. On the porch is the front door that has the door knob that was heard rattling in the early morning after the rock throwing incidents. 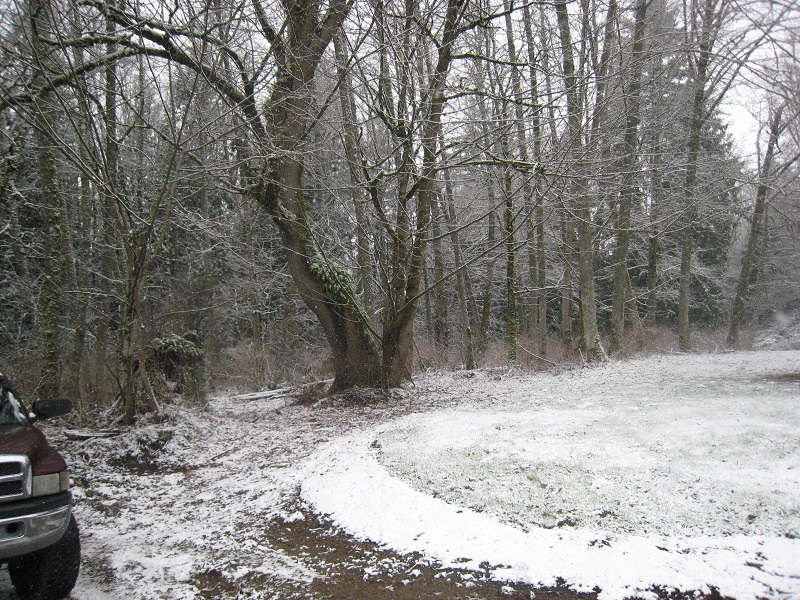 Here is a view from in front of the house towards the woods where the rocks were thrown and the growls were heard. 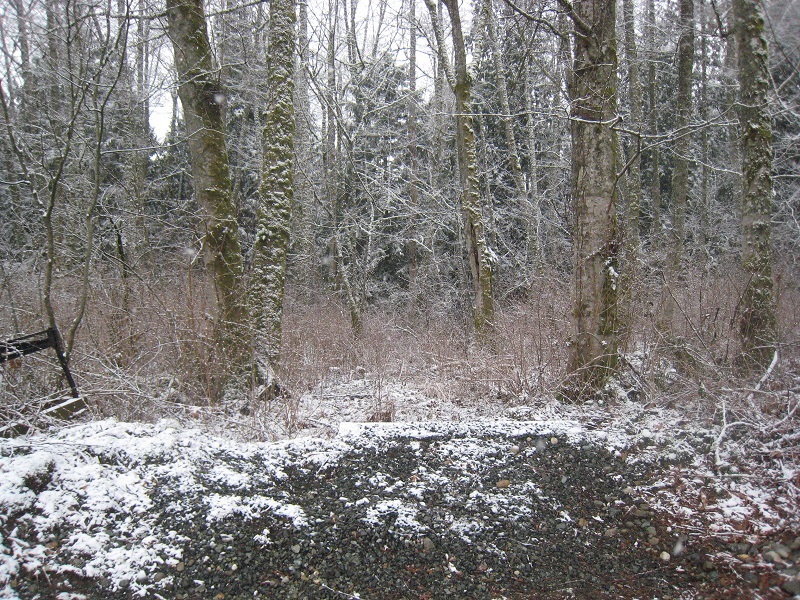 A family member saw a sasquatch standing to the right of this tree one evening. The tree branch that was at the same level as the top of the head of the sasquatch was later measured at 8.5 feet from the ground. 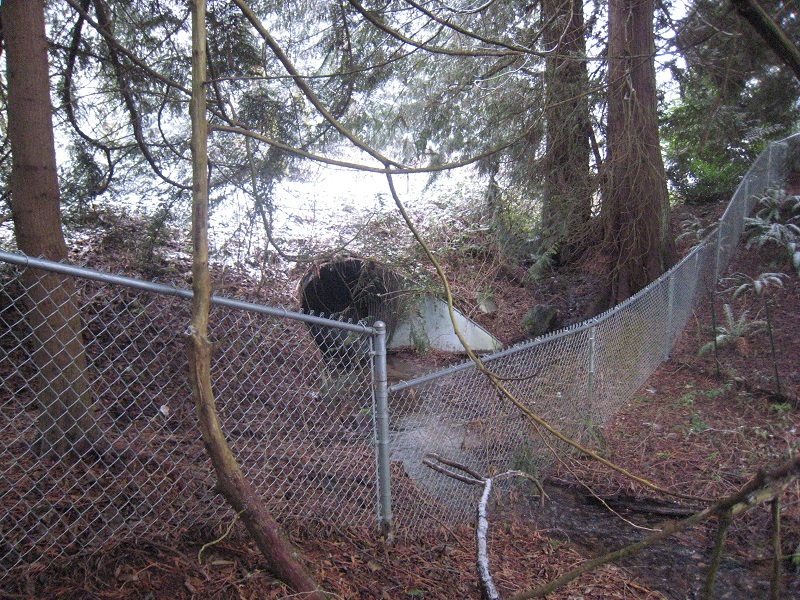 After being spotted, the sasquatch turned around and ran through the woods to a stream, and was then heard making splashing footsteps while running through this culvert under the road. The culvert height is approximately 5.5 feet. Here is the fence that is on the other side of the road and culvert from the witness' property. It crosses the stream that runs through the culvert and the yards of several of the nearby properties. 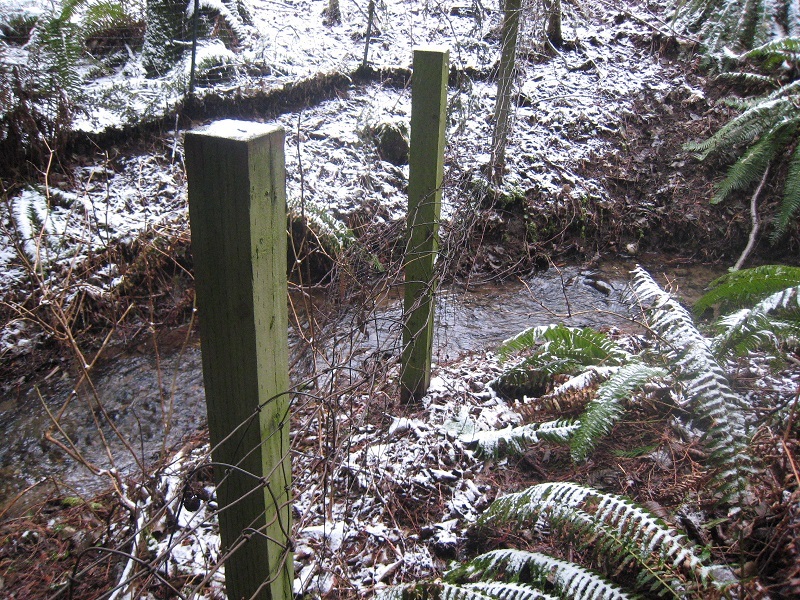 The post heights are approximately five feet, and the wire has been pulled off of the posts and been rolled down as if to provide an easier way to go over it. The wire is large gage and very strong, and neither the witness nor I could twist or roll this wire to re-shape it. This is a branch in a cedar tree that is next to the fence by the culvert. It is approximately eight feet off of the ground and has a diameter of almost 11 inches. It has been recently twisted and turned sideways from the other branches on the tree. 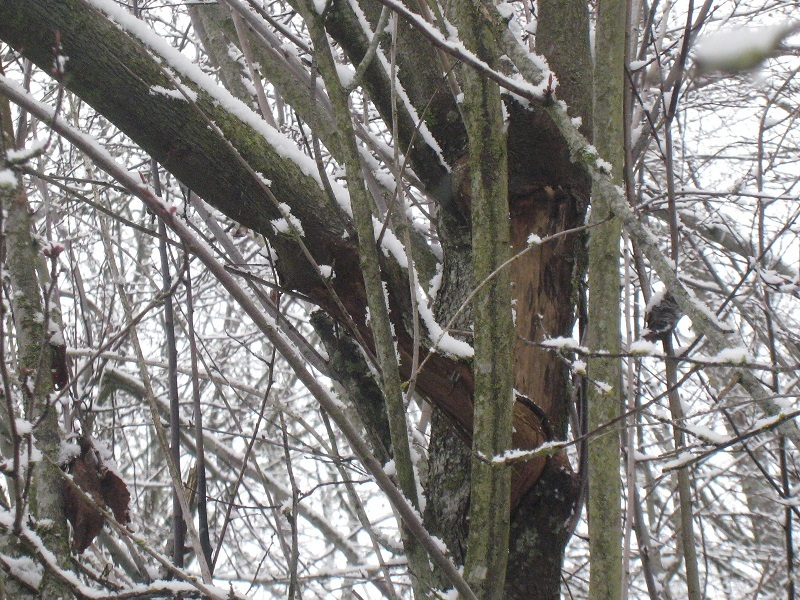 Here is a close-up picture of a branch break in a tree in front of the house. 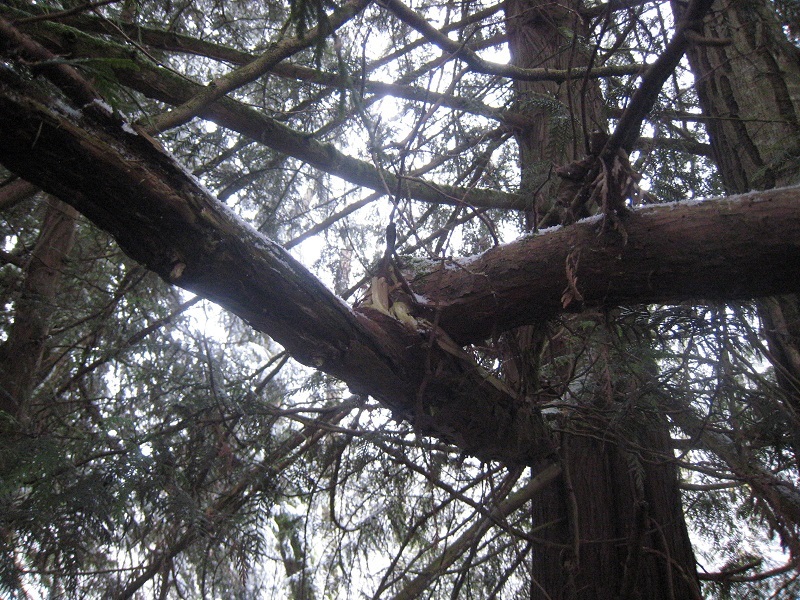 The branch is approximately twelve feet from the ground and has been twisted and peeled down. The witness has recently had many tree branches broken and twisted on his property; and has heard several large trees being completely uprooted and pushed over at night, accompanied by screams from an unknown source. The witness has also been outside during the evening and made clapping and other sounds, and had the same sounds repeated back to him from the woods. It is very plausible that the witness has on-going sasquatch activity around his residence and in the entire neighborhood area. Here is a link to the previous report that was filed by the witness.